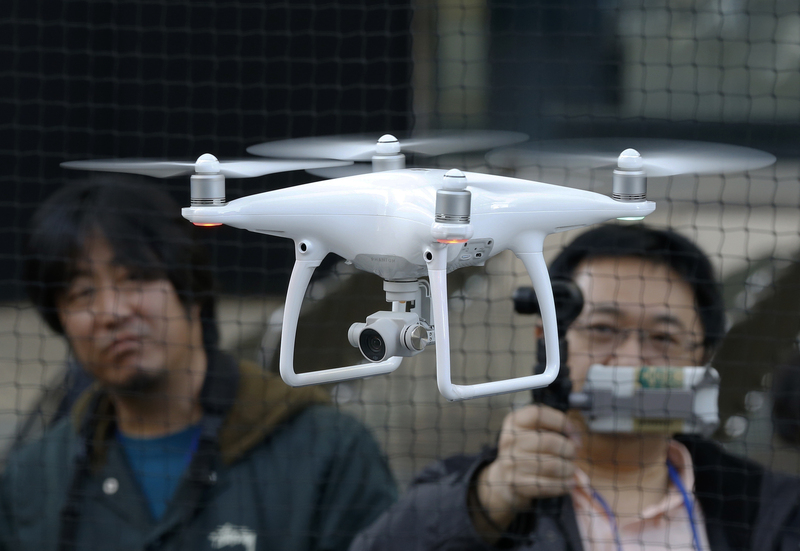 Major Chinese consumer-drone maker DJI has its eyes on the potentially lucrative Japanese market after regulations on drones were relaxed three months ago. DJI Japan General Manager Allen Wu launched the latest model, Phantom 4, Thursday in a fashionable mall in Tokyo. In a demonstration, the machine, which has propellers, cameras, sensors and automatic tracking technology, zipped around and followed a stunt bicycle-rider, successfully dodging a signboard. 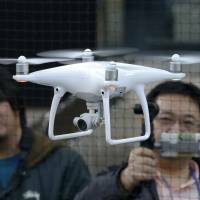 Shenzen-based DJI says it controls 70 percent of the world consumer-drone market. The niche market has great potential to grow, especially in Japan, a nation of avid photographers and videographers, some of whom are already using drones. Japan’s first law on drones went into effect in December, with restrictions such as limiting them to daytime use, prohibiting explosives and not allowing flights over large crowds. Government permission is also needed to use them near airports and other special areas. DJI, founded 10 years ago, has become a dominant player in a product that delivers excitingly visceral video taken from levels far lower than the usual aerial shots from a helicopter. Wu said some 70 million shots had been taken with DJI drones in the past year. Footage shown at the event showcased high-definition-quality imagery and impressively smooth panning. The Phantom 4, which has a flight range of 5 kilometers, sells for ¥189,000 ($1,600) in Japan, and $1,399 in the U.S. Its maximum speed is 72 kph. It comes with a “return to home,” function, meaning it will come back safely if it loses radio contact while battery life lasts. DJI is the first Chinese company to be the industry leader in an emerging technology. It could take Japan by storm because of the lack of major local competition. Yamaha Motor Co., for instance, makes drones, but they are for businesses. Last year, Sony Corp. invested a majority stake in Japanese drone company Aerosense, but its drones also are not for consumers.